The equity based destination club has added two new residences for its members. The clubs first New York City home has been the most popular location for members to visit. 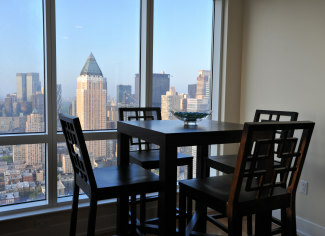 The fund has now added a second residence in Midtown West, just steps from Times Square. The images above and below show the residence and the views. The two-bedroom/two-bathroom home features an Italian-style gourmet kitchen and floor-to-ceiling glass windows. The building includes a fitness center, business center, café, swimming pool and sundecks. There is also a residence lounge with a private screening room, available for entertaining guests, and a catering kitchen is located on-site to assist with your party-planning needs. Just 200 yards of Windansea Beach - a world class surfing beach that entertains surfers & spectators alike - is the new Equity Estates residence. The four bedrooms and four and a half bathrooms home provides almost 5,000 square feet of space. The home has a fully equipped exercise room, a grand media/game room, a day room for quieter reflection and a separate study. The gourmet kitchen is perfectly designed for entertaining. La Jolla, California is located just 15 minutes north of downtown San Diego. The town has beautiful beaches, fine restaurants and art galleries. For family trips there is San Diego Zoo & Wild Animal Park, Sea World, LEGOLAND, Universal Studios, Disneyland and California Adventure. The La Jolla home balances out the Equity Estates portfolio and makes it more appealing to West Coast members. The fund buys some homes and leases others for the use of its members. 80% of the members initial investment goes towards buying the homes. New York is immensely popular with members at most of the Destination Clubs. From the numbers we've seen the average length of stay in New York, at 3-4 days, is shorter than vacations in the mountains or at the beach. So folks are very much using these residences for weekend getaways or mid-week shopping and theater trips. A few weeks ago we looked at fractional homes in New York and reviewed some of the properties that are currently on the market. Not enough adjectives for Cabo!